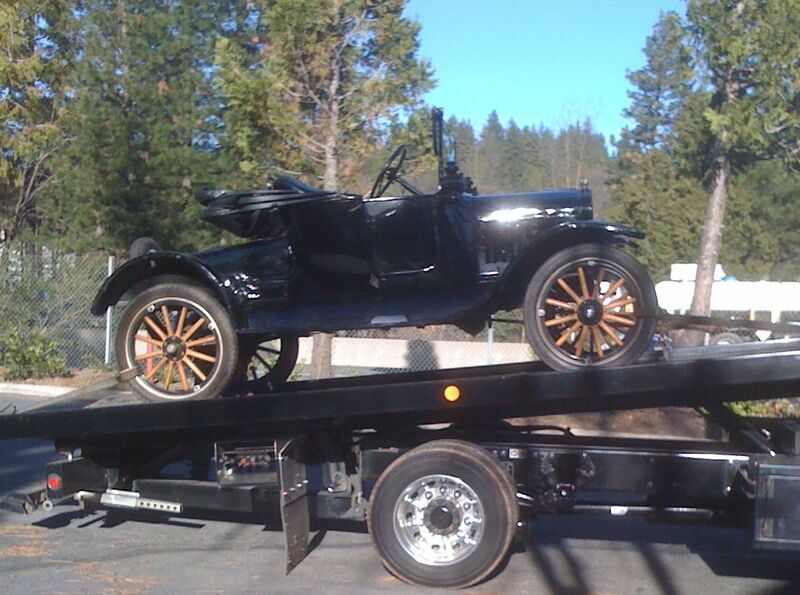 The new car (1919) arrived home after only a few misadventures. Its temporary name is “Puppy” since the photo file that was sent to me by the previous owner was labeled “New Puppy” and that’s a good name for now. BTW it’s a six-hour drive back from Fortuna on Hwy 101 and Hwy 20. It had a few problems but nothing really catastrophic. The car did fall off the trailer when I was loading it in the cold and icy morning. Kevin and I managed to leverage it back on. Kevin is one of those true friends who will never let you down and, in this case, without whom I would never have managed to “rerail” the car. 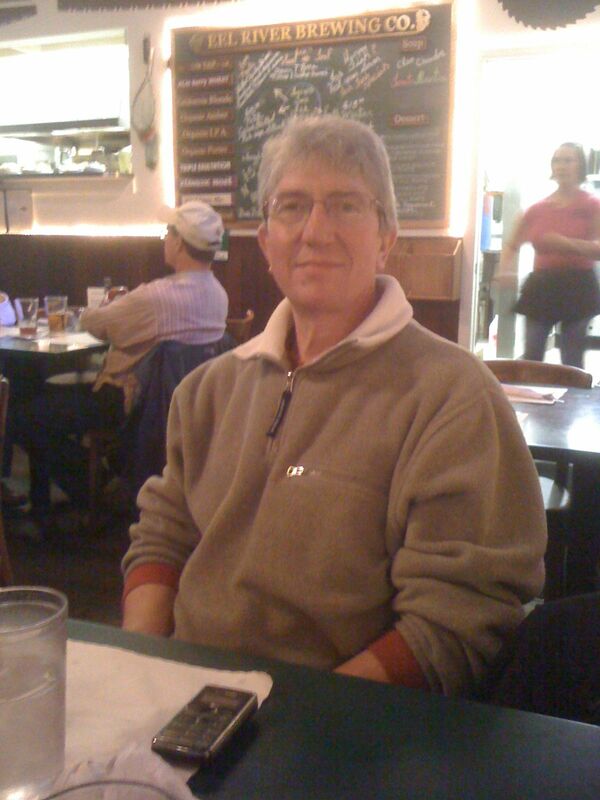 I’ve known him for nearly forty years since when he was a teenager working in his dad’s hobby shop. We rediscovered each other a few years back. I’ve replaced a few parts and have a few on order. There is a little body work to do. For example, the entire body is shifted about one inch to port. This means the hood won’t fit properly. Happily the Model T body is held on with only four bolts (really) so by loosening three of them I can persuade the body to move a bit to starboard. Another item: there has been quite a bit of repair around the door (the only door on a Model T of this style is the passenger door) and a lot of the filler is cracked and needs to be replaced. It’s an easy and inexpensive job. Maybe I should call her “Bondo”! I have been happily driving around the foothills to break in both the car and myself. This is in preparation for an inaugural trip to the cultural capital of Camptonville; that’s not too far as the crow flies but I’m going to be taking backroads and that doubles the regular mileage. Yesterday, being as fine a day as anyone could want in January, I went for a drive and low and behold she just stopped. The starter wouldn’t work and the hand crank produced nothing but sweat and a few curse words. For the purists out there, 1919 was the first year in which a starter became available. Hello AAA. I discovered that the Bendix spring (gearheads will know what that means) had broken. A new one is on its way. In the meantime I’ve been researching ways to safely run a Model T on twelve volts with which this is equipped, rather than the six volts it was designed for. The twelve volts is apparently a little hard on the six volt starter. I added a suitcase to the port (left) side. That looks better that nothing behind the luggage rail. I’ll put a toolbox on the other side. It’s beginning to look “sincere”. This entry was posted in Model T Ford and tagged Model T Ford. Bookmark the permalink.